Our custom sleeved 8 Pin PCI-E extensions are handmade, using the highest quality materials, and are made to order. Extensions are 12 inches, curved, made from PET Sleeve material. What materials are V1 Tech cables made of? We use high quality 18AWG wire and plastic PET Sleeve in vibrant colors to match the colors of our custom mod parts line designed to help you achieve the perfect themed build. What is the point of the cables being curved? We use different length wires to create a natural curve to help route your cables easily and in the most aesthetically pleasing manner for a more professional look. Why do you ask for our GPU (Graphics Card) Model for PCI-E extensions? Unfortunately, GPU (Graphics Card) manufacturers don’t have a universal standard for the orientation of their clips/plugs. We use your model to identify the best routing for the cable so we can make it curve perfectly for your card. What is the difference between EPS and PCI-E? EPS refers to cables that plug into your motherboard while PCIE referes to cables that plug into your GPU (Graphics Card). Will V1 Tech Cable Combs work with my cables? These combs are made to fit standard 18 AWG wire sleeved in 4mm pet sleeve or paracord material. What are the thickness and material of the cable combs? 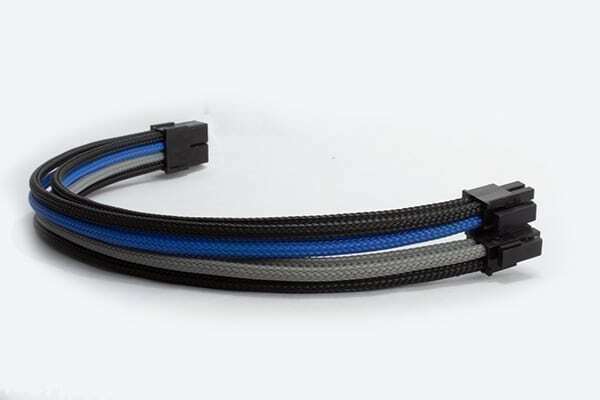 Our cable combs are made from 1/8” (3mm) cast acrylic material. Will V1 Tech cable combs break easily? It’s normal to break some in your first attempts with high pressure. Just in case, we recommend purchasing a few extra. However, if installed correctly you should have no troubles and the combs can be easily adjusted while on your cable extension. Got a few 12″ to clean up my fan cabling. Feel well made and look good (grey). Good color, well made and shipped in a fast and timely manner. I am going to be ordering another full set sometime next year when i change my color theme. Thank you again for everything v1tech. I got what i was in need of, Colors came out really nice. Quality is there without having to break your pocketbook. So happy i ordered cables from v1tech. Keep up the good work. Good quality and beautiful colors. Love the uv reactive part! Good luck finding higher quality cabling.